With Citibank Online you can fulfil your banking needs wherever you are in the world, however you want, available 24 hours a day 365 days a year, giving you complete control over your finances. *Please note this screen is for illustrative purposes only. A One Time Password (OTP) will be sent via SMS to your registered mobile phone number which you will need to enter to complete the activation. In addition, you can also activate your new card at Citi Mobile. Click here to learn more about Citi Mobile. After activating your card, please register or login on Citibank Online to enjoy the benefits of lower transaction and FX rates as well as the comfort of banking 24/7 wherever and whenever you need. With the account dashboard, you can view your accounts available and hold amounts. For your Credit Cards, you will be able to view your payment due dates and rewards points. In addition, in the Quick Links section, you will find a list of quick links to other online services. On top of that, you will be able to know your online score distribution by clicking on the E-Quotient banner on top of the Quick Links section. This online score distribution tracks the list of online services that you are enrolled in. Pay your Citi or other non-Citi credit card within a minute, transfer money globally and enjoy lower online transfer fees and FX rates, or pay your UAE utility bills with no extra cost. Your other bank credit cards and special transfers can be done through the 'Other Transfers' option. Instant payments - You can view the outstanding amount on your Bill and make payments that will reflect instantly! Billers - Our list of Billers include Du post-paid and pre-paid, Etisalat pre-paid, Salik, DEWA and SEWA. Add payees - Add your account numbers as payees to complete your utility bill payments. The Service Center gives you even more control over how you manage your money. Get rid of the clutter. Check your E-Statement today. Your monthly statement is available on Citibank Online, 1-2 days after your statement date. Click here to view the short demo on where you can view your electronic statements on Citibank Online. Access a select list of mutual funds offered by renowned investment managers. Do you want to be able to act on your investment decisions, at your convenience and wherever you are in the world, without contacting your Relationship Manager, Personal Banker or CitiPhone? With online card linkage, you can change your primary account by linking your debit card from one account to another (in any currency, provided that such currency is AED, EUR, GBP or USD) when travelling or making an online purchase to protect you from foreign exchange fluctuations. Follow the simple instructions and your card will be linked instantly to your chosen account. In the rewards section, there are four main tabs that you may select to view - rewards earned, rewards history, rewards catalogue and other rewarding privileges. The layout is designed to allow you to redeem your rewards and select the type of rewards in a few easy and simple steps. We consider the security of our customer’s personal data a top priority here at Citi. In light of this, our new internet banking system has enhanced security measures. Along the simplified sign on method, our innovations follow our customers’ needs and the market trends. Sign On - You will need to enter your registered User ID and Password using the Keyboard (No virtual/on Screen Keypad) this is part of the new system upgrade for your own convenience. Security Questions - You will be no longer required to answer a security question upon entering the User ID and Password when you Sign on. One Time Password - When you perform certain actions, such as activating your card, adding new payee, viewing your E-Statement. Citibank Online will now ask you to enter a One Time Password. This password will be sent via SMS to your primary mobile number registered on our records allowing you to complete your request. Paying your Utility Bills has never been easier! Now with the New Citibank Online, you can pay your Utility Bills from your Citibank Credit Card or Bank Account at no extra cost. In addition, we’ve enhanced our system so that your payments will reflect immediately. So what are you waiting for, add all your payees and pay on the go! Instant payments - You can now view the outstanding amount on your Bill and make payments that will reflect instantly! New Billers - We have extended our list of Billers to include Du post-paid and pre-paid, Etisalat pre-paid and Salik. Add payees - Some of your existing payees were deleted as part of the system upgrade and you will need to add your account numbers for DEWA and Etisalat as payees to complete your utility bill payments. 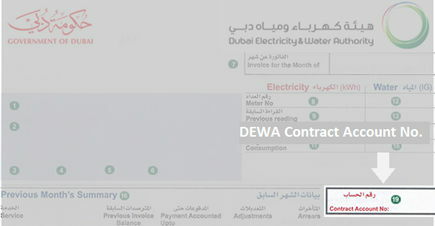 For DEWA accounts, please enter the account number as the 10-digit Contract Account number mentioned on the top right side of your bill as illustrated below. Citibank Alerting Service comes in two packages, Banking Standard and Cards Standard, which you can choose from depending on your preferences and needs. Account BalanceOnce a day/week/month You will receive an alert with your checking account balance based on the frequency you select. Time Deposit Subscription Alert will inform you about your Time Deposit placement execution. Time Deposit Maturity Alert will inform you about your Time Deposit maturity. Time Deposit Renewal Alert will inform you post the Time Deposit Renewal. Time Deposit Redemption Alert will inform you at the time of redemption of a Time Deposit credit into your specific account. Account Overdrawn You will receive an alert notifying you when your checking account is overdrawn. Debit Card Transaction You will receive an alert when you use your Debit Card for retail purchases. Direct Debit Order not carried out You will receive an alert when Direct Debit set up on your account was not successfully completed. Standing Payment Order not carried out You will receive an alert when a Standing Instruction or a recurring transfer set up on your account was not successfully completed. Order Rejected eBrokerage You will receive an alert when your eBrokerage Order is rejected. Account Debit You will receive an alert once your checking account is debited by any amount for (ATM Withdrawal, Loan or Card Payments, Scheduled Instructions etc.). Credit on Account You will receive an alert once any amount is credited to your account through (Cash Deposit, Online Transfer etc.). Supplementary Card Balance Once a Week You will receive an alert informing you of balances and limit available on your Supplementary Card (if any) based on the frequency you select. Supplementary Card Transaction You will receive an alert when your Supplementary Card (if any) is used for any purchases or ATM Cash withdrawal. Credit Card Transaction You will receive an alert when you use your Credit Card for any purchases or ATM Cash withdrawal. Access “My Profile” and select “Citibank Alerting Service” option to setup your Citi Alerts and be in control of your finances! Go to "My Profile" and choose "Citibank Alerting Service"
Click on "Edit Alert Profile"
Please select from online banking questions and topics to resolve the most commonly occurring issues in a few simple steps. I have entered One Time Password incorrectly and I’m not able to access Citibank Online, what should I do? Don't share it. No one representing the Citigroup family of companies will ask for your password in any way other than through the secure Web form on our Web site. And you should never give it to anyone who asks for it via e-mail, phone or any other medium--even if they say they're from Citigroup. Always sign off. End your session properly by selecting "sign off" and then closing the browser window--especially if you're using a PC at an Internet cafe or other public place. If you are receiving “information not recognized” error message while registration. What should I do if not receiving OTP? If you have changed your mobile number recently or you have never received OTP before, please login to Citibank Online and update your mobile number under 'My Profile' -> ', Update contact details' and check if you are enrolled for SMS alert by selecting ' Manage alerts from Citi' in the Quick Links section on the right side of the home screen. The One Time Password is a security measure we have introduced as part of the improved Citibank Online. Please read on to understand more on how it works. How does the One Time Password work? When you undertake certain actions using Citibank Online, you will be asked to input a One Time Password. The screen to enter the One Time Password appears as below and you cannot proceed to the next page, or complete your action, until the correct One Time Password is entered into the box on the screen. You simply enter the password you have received by SMS into the box on the screen. The transaction will go through as normal and the whole process takes about one minute. Because you can only complete certain actions by entering the One Time Password, it provides extra reassurance that you are the only person who can access and use your account. Why is there a new security measure? We consider the security of our customer’s personal data a top priority here at Citi. In light of this, our internet banking system has enhanced security measures. Along the simplified sign on method, our innovations follow our customers’ needs and the market trends. Therefore, giving a One Time Password is required now to add new payees, make transfers to non-registered payees, activate your cards, change your User ID, Password, Contact Details or ATM PIN. Your One Time Password is a 6-digit code that will be sent in an SMS on you mobile number available in our records. When will I need to use the One Time Password? With some of the actions above you will need to enter a new One Time Password each time you use them. However, others will only request the One Time Password if you have not already provided it during that session. In all cases, it will be made clear when a One Time Password is needed. How long do I have to enter the One Time Password? This six-digit password should be entered as soon as you receive it. It will expire after 15 minutes, after which you will need to start again. It is important that you do not keep trying to enter a One Time Password that has expired, because online access to your account on Citibank Online will be blocked for 24 hours. Instead, if the One Time Password expires because you have waited too long, you will need to begin the action again and we will send you a fresh One Time Password. How do I ensure you have my up-to-date mobile number? Please sign on to Citibank Online, go to My Profile and Update Contact Details. You will be able to view your mobile number available in our records. For security reasons, only the last 4 digits of the mobile number will be displayed. If your mobile is not updated, please call CitiPhone Banking Service to update. Always ensure that your up-to-date contact information is with us to facilitate seamless access to your accounts online. If we do not have your correct mobile number you will not be able to use many of the features of Citibank Online. What if I do not receive the One Time Password? We send the six-digit password to the mobile phone number that is shown on the screen that pops up when we ask you to provide the One Time Password. It is important that you ensure we have your up-to-date mobile number for this purpose. If the number shown on the screen is incorrect, or you do not receive the One Time Password, please update your contact information in "My Profile" section of Citibank Online, or call our 24-hour CitiPhone Banking Service on +9714 3114000. Do I have to use the new One Time Password system on my mobile phone? Yes, it is an important security feature designed to protect your account information. You cannot opt out of this service. What will the SMS text message containing the One Time Password say? The One Time Password SMS will contain the following: Dear Customer, your One Time Password for Citibank Online is: 123456. If you did not initiate this transaction, please call +9714 3114000 now. Please note this text is for illustrative purpose only. I received an SMS with a One Time Password but I have not requested this – what should I do? Please call us immediately on our 24-hour CitiPhone Banking Service +9714 3114000. It is very important that you contact us straight away as an unexpected message of this type could indicate your Citibank Online details may have been compromised and someone else may be attempting to access your account. I received an SMS telling me that I have updated my mobile number, but I have not done this recently. What should I do? The Mobile Number update SMS will include the Mobile Number that has been changed and the alert is sent to your old and new Mobile Numbers. If you have not initiated this change request, Please call us immediately on our 24-hour CitiPhone Banking Service +9714 3114000. To avoid delays when banking online, when is the best time to provide my mobile number? If I enter the incorrect One Time Password more than three times, what aspects of my online account will be restricted, and for how long? If you entered an incorrect One Time Password more than three times, your access will be restricted from Citibank Online for 24 hours. If I call CitiPhone, will you be able to remove the restriction on my Citibank Online account? Unfortunately, we will not be able to lift the online restriction. It will stay in place to ensure your account is protected. Whilst the online restriction remains in place you will have the option to call us if you need to request transactions or account servicing. What is the minimum and maximum amount I can pay for my utility bills? These are the minimum and maximum amounts that you can pay online. If you have answered “No” to any of the questions above, please click here to go to the sign on page and request for a User ID reminder or reset your password, or to register on Citibank Online. Choose “Citibank Online Preferences” in the “My Profile” menu and click on the “Masking Account Information” item. Uncheck the checkbox to unmask your sensitive data and click on “done” to complete your request. If I am travelling, or want to avoid foreign exchange fees, what should I do if I would like to use my debit card in a different currency? If you do not have a current account in the desired currency, you can open one at any time by calling our 24-hour CitiPhone Banking Service on +971 4 311 4000 provided that such currency is AED, EURO, GBP or USD. If you already have the desired account in the appropriate currency, you can link your debit card to any of these accounts whenever you want by clicking on the Link Account link at the top of your Homepage after you Login. What should I do if my card got lost or stolen? You will also need to file a police report. Please note that blocking your card will not prevent you from using Citibank Online, and you can continue managing your finances online, while you are waiting for your new card to arrive. You can set the account order and visibility on “My Citi” by clicking “My Profile” and selecting “Manage Accounts/Account Order and Visibility.” Alternatively, you can reach this menu directly from My Citi with the help of the “Manage Accounts Display” link above your account list. If you have accounts in Citibank in a different country, you can also register to the Global View of Accounts feature, which allows you to see your accounts in one portal. To do this, click on “My Profile” and select “Global View of Accounts/Register”. After you successfully register, you can switch between countries on “My Citi” with the help of the drop down list at the top of your accounts page.